If you think this looks familiar, then you would be entirely right. 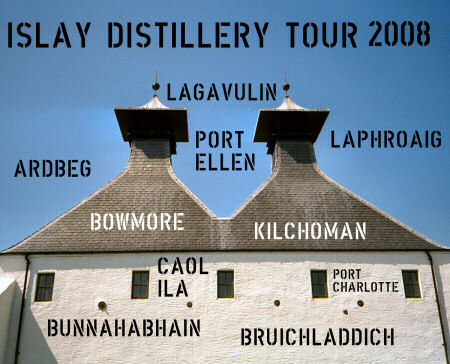 It's the 2008 version of the Islay Distillery Tour 2007 T-Shirt. I've taken the template I created earlier this year and updated it for 2008. The distilleries listed are still the 8 current distilleries (Ardbeg, Lagavulin, Laphroaig, Bowmore, Kilchoman, Caol Ila, Bunnahabhain and Bruichladdich) as well as Port Ellen (for the maltings) and Port Charlotte as the future distillery. So if you need a present for someone planning to visit Islay next year why not head over to Armin's Little Islay Shop to take a look? There are other designs available as well, including the 2007 version if you are looking for a late souvenir for this year. Shameless plug over, thanks for your patience.